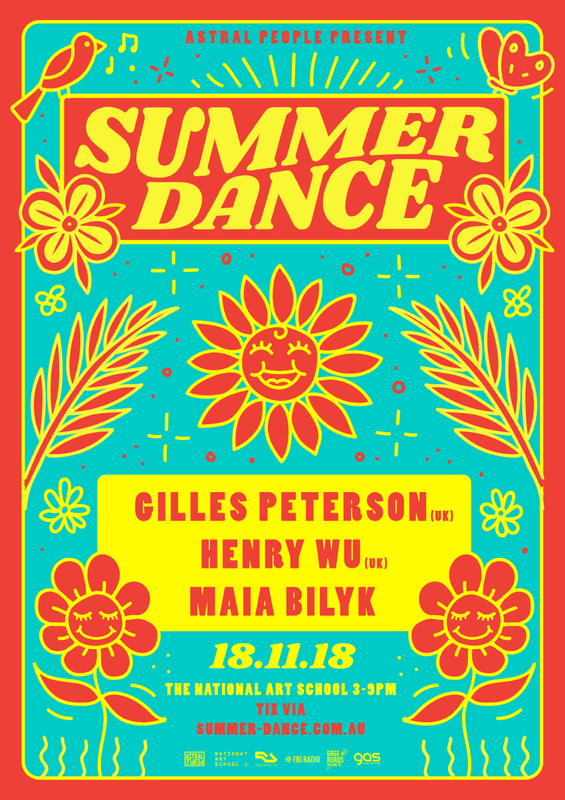 We are happy to announce the return of Summer Dance - a series of outdoor parties igniting the grounds of Sydney’s National Art School. After a sold-out series last season, the first instalment arrives on Sunday, November 18th promising effervescent grooves and invigorating vibes curated by hand-picked international heavyweights and local tastemakers, making for a quintessential weekend session to kick off your summer festival season. Bracing Australian shores for the blissful party is no other than international club DJ, record label boss and legendary radio producer/presenter Gilles Peterson. An industry pioneer in creating some of the world’s most memorable dance parties, Peterson continues to electrify crowds with his Worldwide Festivals across Europe and Worldwide Awards in London. With his collection of jazz and hip-hopdrenched compilations and experimental club mixes, including the recent Sun Ra compilation and Havana Club Rumba Sessions, as well as his long-esteemed Worldwide FM platform, the dance floor connoisseur will be taking to the Summer Dance stage with the same energy and experience that fuelled his iconic underground sessions at North London club Dingwalls during the 80s. Emerging from his reign across UK underground to soundtrack your Summer Dance afternoon is South London’s Henry Wu. His exotic modern fusions of jazz, broken beat and garage have seen acclaim from the likes of IG Culture, Osunlade, DJ Spinna, Benji B, and none other than his Summer Dance mate, Gilles Peterson. Thriving at the forefront of London’s new field of creatives with a slew of sold-out EPs, the artist/DJ now heads up his own label Black Focus Records. Married with luscious mixes from Peterson, this year’s selection of international artists makes for an unforgettable afternoon at Darlinghurst's National Art School. Capping off the stunning line-up is Sydney’s own Maia Bilyk. Championed throughout the local music community for her impassioned finesse behind the decks, Maia has grown as a big name in the FBiRadio family and throughout the festival circuit. Erupting into the luscious surroundings of the National Art School with her groove-centric funk, soul and house blends, Maia perfectly wraps up the summery afternoon’s impeccable roster. Having showcased the likes of international dance juggernauts Moodymann, Omar S, Honey Dijon, DJ EZ and Australia's own Touch Sensitive, this event has evolved into an undeniable summer classic and continues to grow with a new calibre of artists in its fifth year. Having sold out all of the past two season's parties, don’t miss the chance to enjoy Sydney’s finest open-air retreat for good music and glorious vibes this summer.